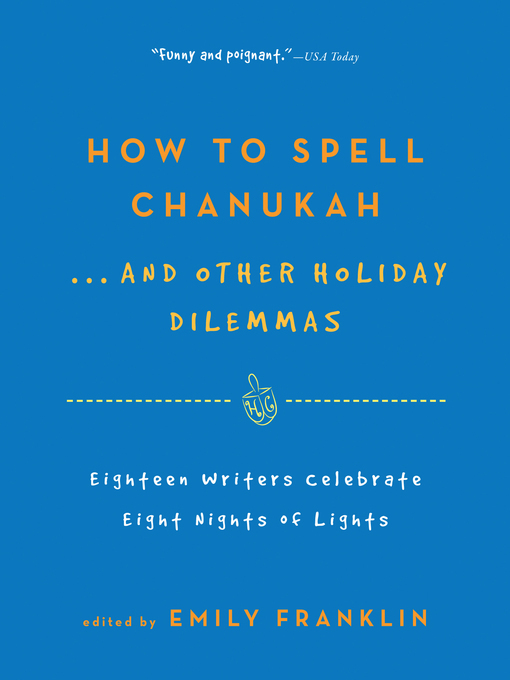 Ring in the holiday with eighteen writers who extol, excoriate, and expand our understanding of this most merry of Jewish festivals as they offer up funny, irreverent, and, yes, even nostalgic takes on a holiday that holds a special place in Jewish hearts . . . and stomachs.Pieces by Jonathan Tropper, Jennifer Gilmore, Steve Almond, Joanna Smith Rakoff, Adam Langer, and others address pressing issues: what is the weight gain associated with eating 432 latkes in eight nights? Offer joyous gratitude: "What a holiday! No pestilence, no slavery, no locusts, no cattle disease, or atonement. Thank God." And afford tender truths: "You are reminded of your real gifts: a family you get to come home to. "Whether your family tradition included a Christmas tree or a Chanukah bush, whether the fights among your siblings rivaled the battles of the Maccabees, or even if you haven't a clue who the Maccabees were, this little book illustrates the joys, frustrations, and small miracles of the season.